After years of languishing, many poets probably thought they’d never see this day come: Poetry is popular again! 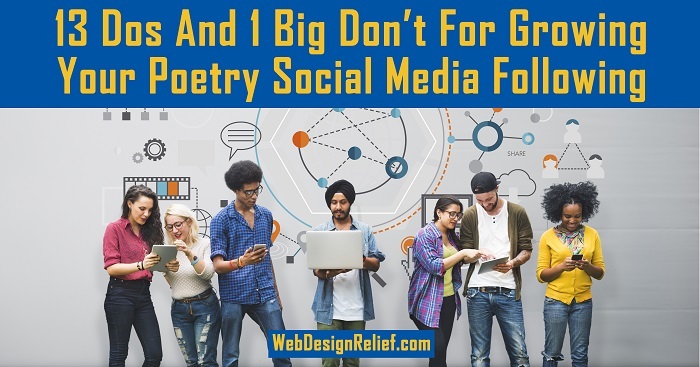 The social media experts at Web Design Relief are tracking a new generation of poets—dubbed “Instapoets” due to their success on Instagram—and these social media-savvy bards are commanding audiences in the hundreds of thousands while enjoying drool-worthy book sales! Join the community. Mingle, watch, learn, and see who’s already at the party. If the online poetry vibe doesn’t resonate with you, you have a few choices: stay and conform, stay and try to change it, or leave and start a party of your own. Learn the etiquette. You don’t have to focus on Instagram to become a celebrity poet. Choose a platform you like! But be sure that you have a deep understanding of its rules—both formal and informal—as well as its etiquette, sensibility, and intentions. Help yourself. There’s a personal development movement in the uplifting verses of many Instapoets. And is it any wonder? Our challenges make us grow—and profound inspiration inspires profound response. Confess. Confessional poetry has a big audience among social media users, so don’t be afraid to share your raw, #nofilter experiences and emotions. A big emotional wallop leaves a lasting impression on readers. And unforgettable images—both metaphorical and visual—can catch your readers’ attention. Get mad. From explorations of institutional injustice to experiences of personal affront, poems that are politically charged or infused with righteous anger are sometimes swiftly shared among frustrated peers. Embrace your passions. What really fires your engine? What makes you obsessed? When you share your deepest passions with readers, you may move them to empathy. Start by finding your voice. Experiment with fonts. Many social media poets find that a photograph (or snipped image) of a well-typeset poem is more readily shared than a poem that has simply been cut and pasted into a word-processing program using standard fonts and margins. Use images. Social media posts thrive on strong visuals. Even if you don’t know the difference between f-stops and ISOs, you can create compelling, artistic (maybe even poetic) pictures using image editing apps that apply filters and effects. Embrace the self-portrait. Confessional poets are the subject of their own poems—and Instapoets often put their portraits front and center regularly on social media accounts. Learn more about DIY headshots. Post often. Long silences may be poignant in poems or conversations—but not on social media. Online, your followers will quickly move on if your social media platform gets stale. Quote yourself. Choose your best quotes and incorporate them into images that followers will want to share and share again. Here’s how. Shorter poems—little poetry snacks instead of ten-course feasts—seem to be fan favorites. Make a slam dunk. Slam-style poems can be social-sharing gold, so hit “record” on your camera and post live recitations of your poems. Monetize, merchandize, and advertise. Create your own collection of poems to sell. Create T-shirts with your best quotes. Book advertising space, guest blogging spots, or pay-to-play mailing list slots. You don’t have to wait for organic notoriety to spring from the fertile fields of the Internet—instead, create a marketing campaign! Poetry purists might argue that there’s no room in poetry for considerations of marketing. It’s the words that should come first (and last, and in the middle too)—not some aspiration to become an Internet meme. Readers can sniff out imposters like teens hunting for free Wi-Fi. Also, keep in mind: What you post on social media may be considered published by literary journal editors. So think carefully before you put up that image featuring your new poem. If you love the poetry, community aesthetic, and vibe of the Instapoet scene, then dive in! But like Mom and Dad always said: Just because everyone else is doing it doesn’t mean you should too. Question: Is promoting poetry online a worthy cause or a waste of time?